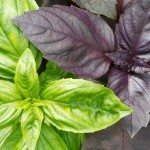 I live in south Mississippi and I'm having trouble with my Basil. A flying bug dark in color attaches itself to the stalk only. If approached, they "jump' around to the back of the stalk. They leave the section of stalk black. This sounds like the Flea Beetle. I recommend Neem Oil as a treatment. Row covers can be a deterrent. Here is a link about this garden pest.